Samsung HT-BD8200 review | What Hi-Fi? Home cinema is more affordable than ever, yet it's easy to see why some remain hesitant to embrace it: installing even the most modest surround set-up involves wires, complexity and a willingness to put up with the aesthetic challenge of having at least one set of speakers crammed into an unlikely corner of your living room. Hence the appeal of the single-speaker soundbar. 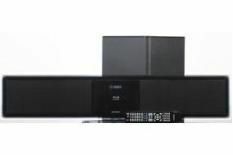 And there's never been a soundbar as flexible as Samsung's HT-BD8200: Blu-ray enabled and iPod-friendly, it may not be the best-sounding home cinema system you can buy, but it's possibly the neatest. The HT-BD8200 comprises just two boxes. The main ‘hub' unit houses both the main speaker array and a Blu-ray player. At 47mm deep, it can be wall-mounted below your TV, although a table-top stand is included. Cabling involves just two wires: an HDMI cable to link to your TV, and a mains plug. You can pay extra for a USB-connected wireless dongle, which gives the Samsung proper network access, as well as supporting streaming of music, photo and video files from your computer. There's an optical digital input for your set-top box, and the unit even includes an iPod dock. Bass, meanwhile, comes from a separate active subwoofer. Place it anywhere in your room, and this wireless unit will seek out the ‘hub' and synchronise with it. It all sounds very clever – and the good news continues when you start listening. Samsung doesn't make any great claims for the HT-BD8200's surround sound performance, and that's entirely reasonable: it never manages to wrap sound effects around you like a Yamaha Digital Sound Projector can. But audio is very acceptable in other regards – a touch shrill at the top-end, perhaps, but largely composed, its compact 16.5cm subwoofer driver doing an admirable job with the biggest excesses of The Dark Knight's Dolby TrueHD soundtrack. Picture quality impresses too, with stable, assured motion-handling and sturdy edge definition. We'd like a little more sparkle, but for the money we've no quibbles. And that's a sentiment that sums up this Samsung. If ever the practicalities of home cinema have put you off investing in it, this is the ideal way to get started.